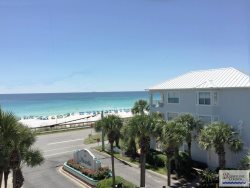 Try this great location for your next vacation in Destin! Summer by the Sea is a small dog pet friendly condo, just steps away from an easy beach access to sugar white sand and the Gulf of Mexico, where you will enjoy free beach service March-October. (Umbrella and 2 beach chairs). This condo accommodates 5 people comfortably. French doors lead from the living area to a covered patio with table, chairs and umbrella - a pleasant place to relax and eat while enjoying the ocean breezes. A heated pool and spa are just steps away. Located on 6 miles of biking, jogging, walking paths on Scenic Gulf Drive in Miramar Beach -- just west of famous Pompano Joe's Beach Restaurant. We hope you will come and vacation here at Summerspell #109 and enjoy this little piece of paradise. All you need to bring are beach towels, swimsuits and plenty of sunscreen! THE BEACH is only a 2 minute walk from this pet friendly ground floor condo. Enjoy easy access to the heated Pool and Spa. There are BBQ grills onsite. Please note: Summerspell offers convenient onsite laundry rooms -- there is not a washer/dryer in this unit.